What can a Galaxy Scout learn about being an Earthling? Latina third-grader Trixie Lopez likes her African-American teacher, Mrs. Buckle, but thinks class is boring; it’s the same every week. Then a flying saucer crash-lands outside their classroom window. A small, orange-skinned extraterrestrial pops out, introducing himself as Spork and explaining that he is visiting the “Earthling training center” to learn as much as he can about Earth customs in order to get his Galaxy Scout Solo Explorer badge. (It will actually be his first badge—he hasn’t been the most successful Scout.) He says he’s just there for the day, but Trixie doesn’t want to go back to the boredom of before, so she hides the Gloop he’ll need to fix his spaceship in hopes of keeping Spork around. However, she feels guilty. Will she give it back? 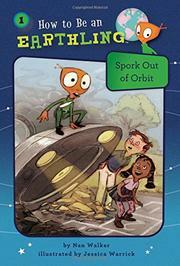 Meanwhile, Spork takes everything literally; can he survive one day in an Earth school? Walker kicks off this multiauthor chapter-book series with a breezy, humorous lesson in honesty that never stoops to didacticism. The other three volumes publishing simultaneously address similarly weighty lessons—lying, shyness, bullying, and responsibility—all with a multicultural cast of Everykids. Lori Haskins Houran penned Greetings, Sharkling! and Earth’s Got Talent!, while Kimberly Morris wrote Take Me to Your Weeder; all are illustrated by Warrick.